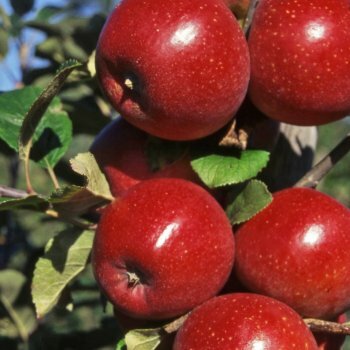 Similar in flavour to the popular Cox apple, Red Windsor produces bright red apples with a slight Cox-like flush. The flavour is excellent, aromatic sweet and slightly sharper than the popular Cox. This tasty apple tree is also known as Sweet Lilibet and is a sport of the variety Alkmene. Being self fertile means that this red apple tree won't require a pollination partner. As well as our usual M26 (semi dwarf) and MM106 (semi vigorous) we also have this variety as an M9 (dwarf) rootstock. Red Windsor doesn't require a pollinator, so only one tree is required. If you do wish to plant multiple fruit trees, you will need to take the rootstock into consideration. An apple tree on a MM106 (semi-vigorous) rootstock will require approx. 4.5 metres between trees, whereas one on a M27 (very dwarf) rootstock will require approx. 1.5 metres between trees.